It is back on - the 3rd annual GeriPal/Pallimed Party during the AAHPM and HPNA Annual Assembly! This year's party will be held at the Tarantula Billiards Bar and Grill on Thursday, March 8th. We will plan to start around 9:30 PM. We are working on reserving the four Billiards tables in the back, so look for us there. 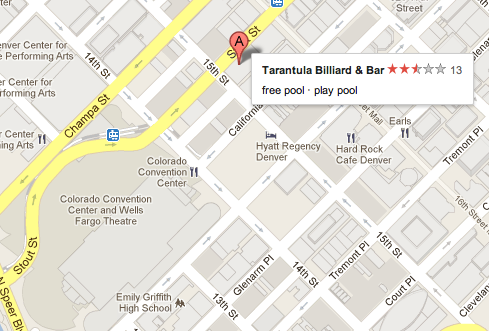 Tarantula Billiards Bar and Grill is one block away from the convention center. The address is 1520 Stout St. The party is open to all, so drop on by.